It's a Sunny Sunday. My husband and I are rolling along the back highways of Virginia, Route 3 to Route 20. Well-kept green fields house Civil War memorials. We whip down the road, grasses bending in the wake. Estates rise out of the fields, tiny in the distance. Huge, far-off magnolias are toy trees. Hand-hewn fence lines keep in the milling cows. They chew and stare off, tails swinging. My window is barely cracked open to let in the sweet, humid air. I hear crickets. Clouds ripple along the pastel blue sky like ruffles on the edge of a girls skirt. Trails line the road for cyclists and tourists alike to tour the old battlefields where countless ghosts loom. Is it possible to fall in love with a place? To bond yourself to the lay of the land, the smell of the air, the unique color palette that filters in through the stratosphere? When I visit my beach home town I like to go sit out on the shore at night and sift my hands through the sand, dig my feet in, watch the moon on the water; close my eyes and breath in all of the memories made up of times spent there. In the rolling country fields of central Virginia, where the old plantation lands meet the fog-clouded blue mountains, a heart beats. It's the heart of the people, my people. We fill this land with life's blood, with spirit. We keep the memories of generations past alive by weaving yarns over bottles of moonshine, plucking at banjos and guitars on our porches, overlooking those ghostly fields with bright sparks of indignant pride in our eyes. I fancy I've caught the feverish infatuation with Charlottesville in particular. The small city vibe, the oddly international population, the food scene. I think folks here consider themselves stewards, protectors and preservers. It's partly the history at the core of Charlottesville that imbues it with magic. But it's the place itself, also, that draws us all into the dream. We're cradled by mountains in this fertile valley, refreshed by cold streams, nourished by the foods (and for many, the animals) that grow here. I can't help but dive head first into the lush eats of Virginia. Food is roots. I sink deeper in with every bite. This salad is seasonal, nourishing and delicious. It's all about balancing textures and flavors for interest. Sweet apricots play off of the crisp, smokey-sweet chickpeas and salty, savory, aged goat cheese. Radishes add snappy crunch, their freshness a contrast to the buttery-sweet fried fennel. I like to eat it with no dressing at all, in the heat of the Summer, or perhaps with a squeeze of lemon overtop. The tahini avocado goddess dressing is so thick that it also makes a fantastic sandwich spread. I think it would be great slathered over toasted sourdough for a sandwich of thick slices of heirloom tomato, sprouts, BBQ tempeh slices, and more avocado. As I said in a note at the bottom of the recipe, this salad would be wonderful with a tart dry cider or a floral, sparkling white wine with notes of apple. A wonderful salad for any season. For mid to late Summer, use peaches or nectarines instead of apricots. In fall go for pears and tiny salad turnips instead of radishes. In a large bowl, combine the chopped kale with 1 teaspoon of olive oil and 1 teaspoon of white wine vinegar and massage for 3-5 minutes with your hands, until the kale takes on an almost silky texture. Set aside. Place a cast iron pan (or any wide sauté pan) over medium heat. Once the pan is good and hot, add the sliced fennel and dry-fry for 5-8 minutes, flipping the slices occasionally, until the fennel begins to brown. Add 1 teaspoon of olive oil and fry further 2-4 minutes. Remove from the heat and set aside. 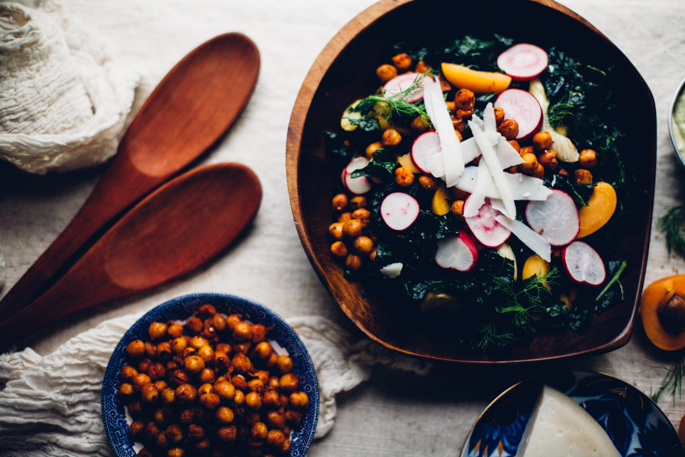 In your salad bowl, combine the massaged kale, fried fennel, radishes, apricot slices, crisp chickpeas and some shaved hard goat cheese and toss to combine. Plate each salad, top with more goat cheese, and dollop the dressing as you please on each salad, to the liking of each person. Pair with a crisp, dry cider or very dry, floral sparkling wine with notes of apple. Preheat the oven to 400F. Line a large baking sheet with parchment paper and set aside. Pat dry the chickpeas with paper towels or kitchen towels until they're mostly dry. Spread the chickpeas out on the baking sheet in a single layer and bake 5-10 minutes, until the moisture has mostly evaporated and they're reasonably dry. While the chickpeas are in the oven, mix together the olive oil, honey (or maple syrup), smoked paprika, and nutritional yeast in a small bowl. Remove the chickpeas from the oven and pour them into a medium mixing bowl. Pour the dressing over top and stir to evenly coat the chickpeas. Spread the chickpeas back out on the parchment lined baking sheet in a single layer. Bake 15-20 minutes more, until the chickpeas begin to crisp up and caramelize. Remove from the oven and let cool 5 minutes before handling. In the bowl of a high powered blender, combine the avocado, tahini, vinegar, lemon, date, miso, water, and cayenne. Add more water to your liking, until you reach the thickness you prefer. Add salt, to taste.